The Community Service Club issued a school-wide challenge: donate 1,000 food and personal care items to the Food Bank of Western Massachusetts. As an incentive, the class with the most donations would get a dress-down day (a most-coveted prize!). 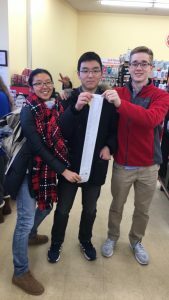 Sophomores Glede Wang, Simon Kim, and Robby Hill shopped for food to donate before winter break. At a recent assembly, Kate Garrity, Director of Student Life Curriculum and the faculty advisor to the Community Service Club announced the winners of the competition—and the fact that as a school, we exceeded our goal, bringing in 1,315 items, weighing in at 1,142 pounds, for needy families. The Class of 2019 was first in the Upper School, and second overall with 340 donations. And the Middle School collected 465 donations, which put them in first place for the entire school.